Did you know that bands of “anarchists” have been running riot in the streets of NYC and all across the U.S.? Well, that’s what the New York Post says. Apparently, they started their dastardly plan to destroy the holidays prior to Thanksgiving. By golly, they are worse than the Grinch! But they were no match for blow-up Snoopy and Woodstock—the parade continued as planned. Phew! I chalk it up to the journalistic integrity of the Post, owned by Fox News CEO, Rupert Murdoch. Thank you, Rupert! Call me old-fashioned, but when I think “anarchist,” I think Haymarket Riot, bombs, Emma Goldman and Alexander Berkman. 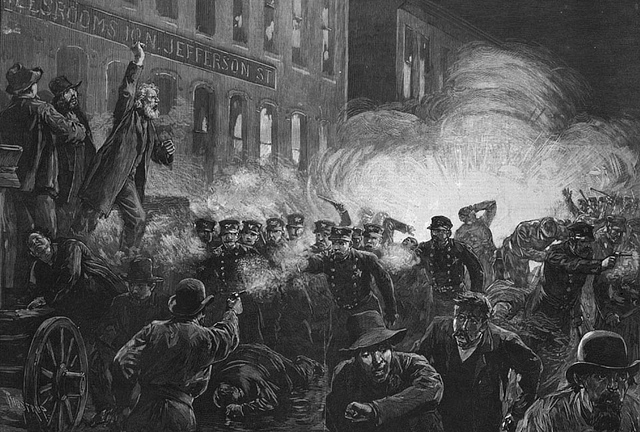 Chicago’s famed Haymarket Riot of May 4, 1886 was a direct response to police brutality during a strike for 8-hour workdays at the McCormick Harvesting Machine Company the previous day. On May 4, several of the better-known labor leaders and anarchists addressed a crowd of sympathizers from the back of a wagon pulled into an alley near the Haymarket, a popular meeting place and square. August Spies spoke, followed by Albert Parsons, who also spoke almost an hour denouncing the capitalist system, and quoting statistics, as he had on numerous other occasions. Parsons’ speech was followed by a speech by Samuel Fielden, another well-known activist. As Fielden was concluding his address, Inspector Bonfield and more than 170 armed other police officers ordered the crowd to disperse. An unknown person threw a bomb into the crowd. Seven policemen and an unknown number of civilians were killed during the confrontation; eight anarchist labor leaders, the “Haymarket Martyrs,” were arrested and convicted of inciting violence and conspiring to commit murder. Four of the eight were hanged as a result of their involvement in the riot. “The public and the mainstream press called for vengeance, the anarchists claimed sabotage, and a wave of popular sentiment against anarchists and labor organizers swept through the city and the country. In Chicago a secret organization of prominent businessmen and employers was formed to counteract the labor activism. Many were arrested, illegal searches were conducted, and rights of free speech and assembly were drastically curtailed. Some labor organizations and activists also protested the violence and supported the government’s response to the bomb throwing. In the meantime, no one knew who threw the bomb or if it had originated in Chicago. Protests in response to the grand jury’s failure to indict Officer Pantaleo in the death of Eric Garner have been mostly peaceful; no bombs were involved. 20 people were arrested for blocking the FDR Drive and for disorderly conduct. “Die-ins” were staged at Grand Central Terminal, an Apple store on Fifth Avenue and in Macy’s at Herald Square. 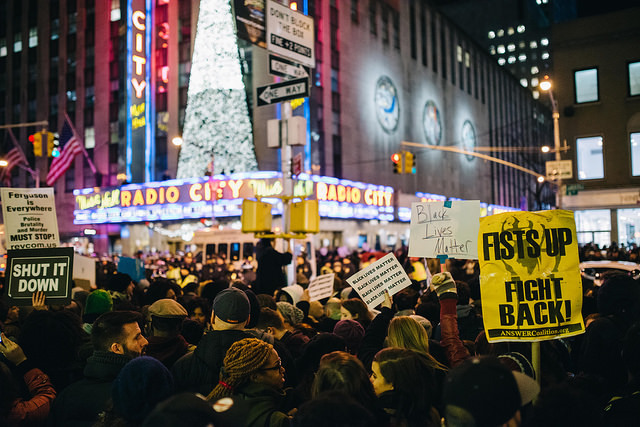 “Protesters chanting ‘No justice, no tree!’ tried to storm Rockefeller Center on Wednesday to disrupt the annual lighting ceremony following a grand jury’s decision not to indict an NYPD cop in the death of Eric Garner. ‘F**k the tree!’ the mob bellowed as cops held them at bay along Sixth Avenue near Radio City Music Hall. After reading this report, I’m wondering why the “anarchists” are so “frustrated.” Any thoughts? As we have observed, nothing can stop the tree lighting, not even the death of an unarmed man selling loose cigarettes on the streets of Staten Island. Only time will tell if the “anarchists” can truly stop Christmas from coming. *For clarity’s sake, please be advised that I do not believe the protesters to be anarchists. I’m ambivalent here, Erica. While I admire your well-researched, well-written column, I’m not sure calling the protesters “anarchists” is accurate or fairly describes the outrage building across the country over, to me, clear examples of police-state tactics aimed at the underclass, including blacks and women. Some protesters might have identified themselves as anarchists, but I feel it’s an exaggeration to apply the label to everyone troubled by the recent police killings and beatings, and the resultant questionable responses by the local judiciaries. Something’s wrong in this country. Maybe it’s been this way all along, and only now, with the proliferation of video capabilities and social networking, is it become apparent to a greater public. As to Christmas, unfortunately the holiday has become so commercialized its true meaning seems at times to be snowed under (sorry–couldn’t resist) by the mounting hysteria to celebrate materialism rather than the spirit of peace and goodwill, the latter of which I wholeheartedly wish for you and your family. Matt, I do not consider the protesters to be anarchists. I was being tongue in cheek, showing how protesters are being portrayed in the Post, but perhaps it came across the wrong way. My fault, Erica. I read it pretty fast, and only just now see that you put quotes around “anarchists” in the last sentence. 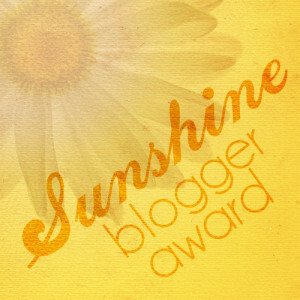 I guess the quotes around some paragraphs and not others threw me, too. A good way to avoid confusing readers like me (still not fully awake on a Monday morning) might be to put the Post stuff all in italics to set it off from your comments. Quote marks can get lost sometimes.